Lawyer, and collector of Hebrew manuscripts; born at London, 1861; son of Chief Rabbi Nathan Adler. His early training was obtained successively in the City of London School and at University College, London. Mr. Adler spent several years in travel throughout the East, visiting all the countries containing small Jewish colonies. From 1888 to 1898 he made three journeys specially to Egypt and Palestine. In 1892 and 1894 he traveled from Spain to Morocco, and in the latter part of 1894 and at the beginning of 1895 visited Algiers and Tunis. During these journeys he made it a practise to seek Hebrew manuscripts, and in this way accumulated one of the largest private collections in the world. 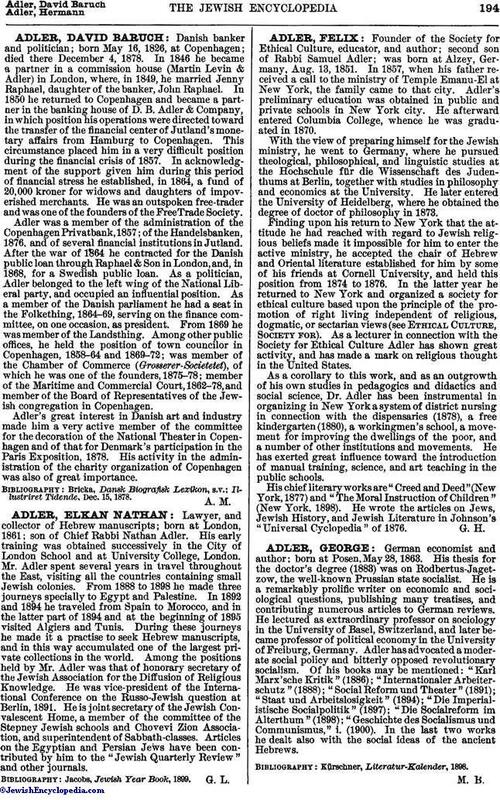 Among the positions held by Mr. Adler was that of honorary secretary of the Jewish Association for the Diffusion of Religious Knowledge. He was vice-president of the International Conference on the Russo-Jewish question at Berlin, 1891. He is joint secretary of the Jewish Convalescent Home, a member of the committee of the Stepney Jewish schools and Chovevi Zion Association, and superintendent of Sabbath-classes. Articles on the Egyptian and Persian Jews have been contributed by him to the "Jewish Quarterly Review" and other journals. Jacobs, Jewish Year Book, 1899.